Gilbane team completes interior office renovations for U.S. Fish and Wildlife Service Headquarters on a fast-track 12-week schedule using Lean construction methods and pull planning strategies. The new, three-floor, 183,000 SF, $15 million fast-track interior build-out for the U.S. 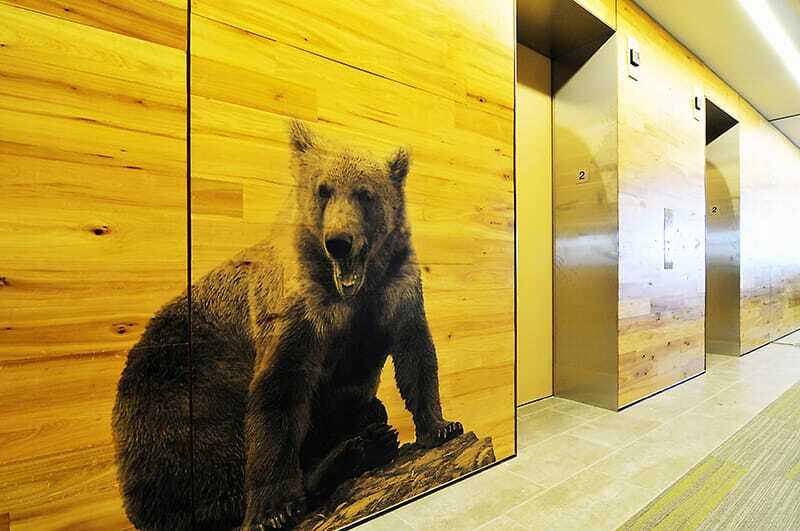 Fish and Wildlife Service Headquarters relocation features a “wildlife theme” which incorporates animal accents throughout the space. The space is also divided into “biomes” which include different elements of each of the five major biomes found throughout the world. The major challenge associated with interiors project was the tight time-frame and aggressive schedule. All three floors were completed within a 12-week schedule, and required a work load of 6 days a week, ten hours a day. The project includes lobbies, copy/pantry areas, huddle rooms, offices, conference rooms, a waiting area, elevator lobbies, a welcome center, and a café. Due to the security requirements for this government client, secure bullet proof spaces were installed. The conference rooms are equipped with four Skyfold partitions, an Italian de-mountable partition and a conference center with 12’ high ceilings. Other significant features include the high-end light fixtures throughout as well as an extensive glass package. 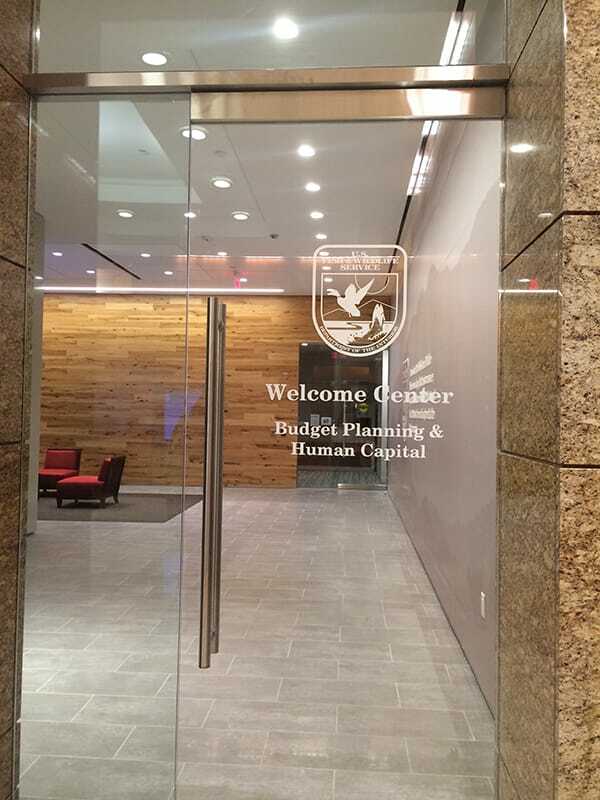 The glass package includes glass fronts for the offices and huddle rooms and a telescoping wall in the conference room, enabling the doors to open simultaneously. The “biomes” include features such as custom vinyl film, in a variety of animal shapes and scenery, placed over office walls. 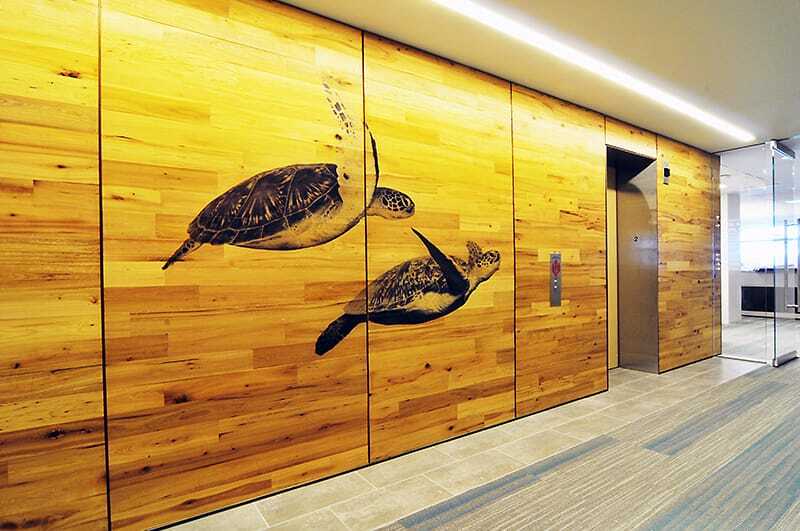 Elevator lobbies will also incorporate the “wildlife theme” by featuring laser printed animals on the wood panels, which line the elevator lobbies. The project is targeting LEED Silver Certification.